This post is a little late, but Prologue Books, which is a subsidiary of F+W Media is offering two free eBooks for Nook and Kindle. The titles: The Screwball King Murder by Kin Platt, and The Evil Friendship by Vin Packer. They are both available until July 1, 2012. If you are unfamiliar with Prologue it is a real treat. It has issued dozens (probably hundreds) of genre classics--crime, western, science fiction and fantasy--in eBook format. A few of its authors are Robert Colby, Vin Packer, Talmage Powell, Wade Miller, Peter Rabe, Jack Webb, Louis Trimble, and Mike Barry (Barry Malzberg). The books range between $3 and $4, and bring a fistful of entertainment. You can check out Prologue's catalog at it website--here. The Screwball King by Kin Platt. Platt is an author I'm unfamiliar with, but it appears to be a pretty good sports mystery. It was originally published in 1978 by Random House and features private investigator Max Roper. If it's good, Prologue has an impressive list of Platt's work available. The Evil Friendship by Vin Packer. Packer is a known quantity. Her work is among the best produced in the mystery / crime genre in the 1950s and 60s. Friendship was originally published in 1958 by Gold Medal, and you really can't go wrong with a freebie. Ed Gorman has released an updated and edited edition of his 1987 novel Night Caller as an ebook. The title has changed to The Girl in the Attic, and it is advertised as, “heavily edited and revised by the author and Patrica Lee Macomber.” I read the original version of the novel a few years ago and really enjoyed it. In fact, I enjoyed it enough to put the updated version on my reading list. It is available from Crossroad Press on both Nook and Kindle, and I highly recommend giving it a read. Night Caller by Ed Gorman Review, Originally posted December 21, 2007. 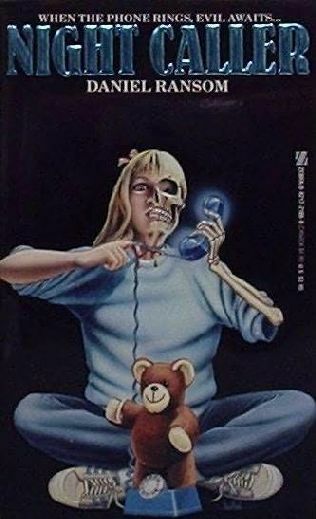 I’m not an expert—or even well read—when it comes to 80s horror, but Night Caller very much has an 80s feel about it. It’s small town horror with a twist of psycho, and maybe just a touch of Stephen King. The characters are amusing, especially a local doctor and a disgraced national television news reporter. The mother-daughter team of Sally and Jamie are central to the plot line, and they hold up well as the story unfolds. There is a large cast of local characters who keep the story fresh and Ed Gorman, as usual, adds more than a little mystery and suspense into the mix to keep it interesting. 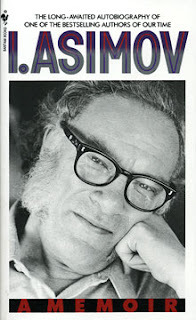 Shortly after Isaac Asimov’s death in 1992 his memoir I. Asimov was released by Doubleday. It is a series of essays Asimov wrote, seemingly, from the narrative and the date of its publication, on his death bed. The book meanders—it starts at childhood, but jumps forward to his early writing career, and then back. It is a patchwork of related postcards rather than a chronological narrative of his life, and it works very well. The essays run about four or five pages—sometimes longer, sometimes shorter—and cover a specific event, person, or idea. He discusses his early life in detail; specifically, working in his parent’s Brooklyn candy store as a boy surrounded by the pulp magazines of the 1920s and 1930s, which he wasn’t allowed to read until he convinced his father the science fiction magazines were about science. The bulk of the book is devoted to his literary life, which, in his own estimation was his life. In several sections of the book he wrote he would rather write than anything else. He did not enjoy travel, and while he did enjoy the company of others, he did not tend to seek it out, and, especially in his early years, he had difficulty getting along and making friends. He touches on his major works—The Foundation series—specifically the original trilogy—“Nightfall,” “The Ugly Little Boy” and many others. He freely admits he enjoyed writing nonfiction more than fiction, and in fact, he considered himself a much more accomplished writer of nonfiction. A sentiment I tend to agree with; however I enjoyed the original Foundation trilogy immensely when I read it as a teenager. The most interesting essays in I. Asimov are the short pieces he wrote about his experiences with other science fiction writers. He had lifelong relationships with many writers, some of whom were part of the science fiction fan club The Futurians. The Futurians, as Asimov describes it, was an off shoot of the Queens Science Fiction club. The split occurred because the Queens club wanted science fiction to keep itself above politics, and specifically not speak out against fascism, which was spreading across Europe at the time, and The Futurians wanted fascism denounced. The Futurians included Frederick Pohl, who has written extensively about the club on his blog at (http://www.thewaythefutureblogs.com/), Cyril M. Kornbluth, and Donald A. Wollheim. He also writes admiringly of John W. Campbell, the editor of Astounding Science Fiction (ASF), who gave Asimov his first real hope of publishing his science fiction stories and also, later, gave him the idea for his short story “Nightfall”. The seed for the story came from a Ralph Waldo Emerson essay titled “Nature”. Asimov seemingly knew everyone writing science fiction in the 1940s through the 80s. A few of the more interesting comments Asimov makes about his contemporaries follows. I. Asimov doesn’t have the depth and detail of an autobiography. It has the feel of a congenial conversation, but it seemingly reveals his character, and he makes a point to highlight his flaws. It is an appealing book written by one of science fiction’s most well known writers, and it is more entertaining and enlightening than I would have imagined.